Dressed in the clean clothes for Namaaz, while entering the mosque you should say the du'a of Bismillaahe wa billaahe and send salaam to all who are present. While unfolding the masalla you should recite the du'a of Waqolil hamdo. If you happen to arrive early in the mosque then facing the qibla you should recite the Qur'an or do the Tasbeeh. After this you should recite the two rak'ats of Tahayyat ul-Masjid. After the completion of these three prayers, you should say azaan for the sunnat of Fajr. 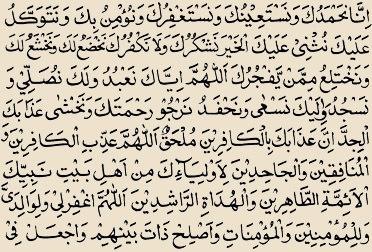 In the first rak'at you should recite Surat ul-Faateha with Surat ul-Kaaferoon and in the second rak'at you should recite Surat ul-Faateha with Surat ul-Ikhlaas. After you have completed the two rak'ats of sunnat, you should place your right hand below your right cheek and recite the following du'a loudly. After reciting the above du'a say the following verse for three times. After completing the whole du'a you should prostrate and stand up to say the iqaamat. Then you should take the niyyat for two rak'ats of the farz (obligatory prayer) of Fajr. You should recite the surah in the descending order. Usually the long surahs are recited in the Fajr. After completing the qeraat of the second rak'at you have to stand in the same position ( qunoot ) as that of taking niyyat of any prayer without raising your hands. 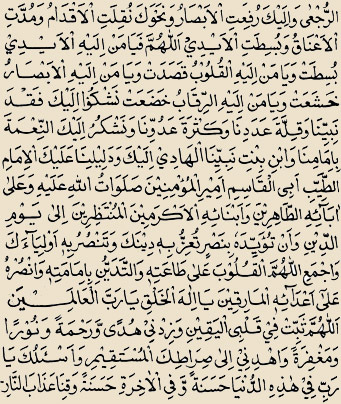 In this posture of qunoot you have to recite the following du'a silently. After this du'a you can proceed to prostrate saying ‘ Allaaho Akbar '. After completing the obligatory prayer of Fajr; you should sit calmly on the masalla and recite all the du'a given under the title “The Different Supplications of Fajr prayer.” It is meritorious to recite the Tasbeeh-e-Maulatana Fatema (AS) and to kiss the masalla thrice and say the du'a of Bismillaahil Lazee at the end. Then you should recite the du'a of Allaahumaghfirlee wa lewaaledaiya while stepping down from the masalla. If you are the mosque then it is mandatory on you to offer the salaam to the Imaam.